OK, it’s hard to remember, these days with ubiquitous air conditioning, and these winter days with icy arctic blasts, but try to think back to summer—or, think ahead to summer, if you’d rather—those Hot Humid Horrible days when the only relief from the heat comes late late at night—outside, because even though the outside air has cooled to a pleasant 75 degrees, inside the heat has been building and is stored like an oven, radiating from the walls and ceiling. This story is about one of those days. Nights, actually. I was working at a radio station downtown, on the third floor of the Hutzel Building, the late evening shift, 6pm to 1am, something like that. Usually I parked my car on the street just at the side door to the building so that when I came out in the middle of the night, I had about 4 feet to go to get to the car. That was important to me because night time is a dangerous time for women and, like many women, I was afraid to walk any distance on my own at night. Years after the day of this story I had a job on campus about a mile and a half from my home; same kind of hours, though. I would walk to work because I didn’t have a car, and it was a beautiful way to see the town, and get some exercise. I took a cab home, though, because even though the city is beautiful at night too, I didn’t dare walk alone at night. That’s what this story is about: walking alone at night. So, back to the hot humid horrible summer night. As I say, I usually parked on the street, just in front of the side door to the building. On this particular night however, there was some kind of festival going on downtown and all the streets were closed to vehicle traffic. I had to park two or three blocks away in the parking lot at the corner of Main and Packard. Now, if nothing had happened, I wouldn’t even remember that night. Being scared of walking alone isn’t unusual, or memorable in itself, It’s far too common, most women will tell you. I got to my car breathless, angry, my heart banging away. I was scared, yes, but now I was angry. How dare he laugh at me for being scared. How dare he mock my safety measures. How dare he go out for a stroll on a pleasant night, a night that was too hot to stay in the house, a great night for a walk to a friend’s house or just walk in the park. At that moment I wanted to lash out… but how? I didn’t care about that jerk, and didn’t have any way to hurt him anyway. I wanted to hurt him the same way I had been hurt—I wanted him to be scared, trapped in the too hot house because it was dangerous to be outside in the cool night air. At that moment I wanted a gun. I wasn’t going to shoot him, I wanted to go around at night randomly shooting random men who dared to casually walk outside in the cool night air. I wanted to build up fear in all men so that they would all be afraid to walk out alone, as I had been for my whole life. So, what does this mean? What has changed in the more than 30 years that have passed since this incident happened? What does it mean? When I watch television dramas, I am struck by how often the story depends on a vulnerable woman in danger. Do you notice it, too? If you haven’t been aware, notice from now on. When there is a female character, she is usually there to create a sense of danger, and a sense of outrage, the entire Law and Order SVU series depends on the outrage about the violation of a woman, a child. When a police show features a woman partner to a male police officer, you can bet your bottom dollar that at some time that woman will be in danger and her partner will save her, or not, and anguish about it after. This is so entirely ubiquitous I have to wonder, Why? What is the advantage to society of women being afraid? I don’t know the answer to this. An odd aside here: have you noticed that in the cop shows these days the top cop, the boss of the division is usually a Black woman? She sits in the office and holds the rest of them accountable. What is that about? How many Black women int he US. have risen through the ranks to the top position? Well, not top, but next to the top, and she is not young fit and beautiful, she is middle aged and frumpy. There are some few strong women characters surfacing these days, but what do they change in the whole picture? They are young, fit, and beautiful for the most part. They wear tight revealing costumes, Wonder Woman style. It makes me crazy. WW in particular, she plays strong and invincible, but she is nearly naked, the very definition of vulnerable. We are always “on view” being watched, judged. Some people recommend self-defense classes, or boxing. I can see that a kind of empowerment could come from these activities for some, but the very concept enforces the idea that women are in danger and need protection at all times even self-protection. Again, we are talking young, fit, working on beautiful. Nothing in self-defense would have stopped that creep from throwing out nasty threats from a safe distance. That guy needed to add to my sense of danger, fear. Why? What did it matter to him? Why didn’t he just go about his business and not bother with mine? I don’t really believe that he presented a danger to me, I don’t even think he was a dangerous person, he was just anybody—any MAN person. Mary Ellyn Cain <mec@intranet.org> is retired from a career in radio, and lives in Bay City, MI. 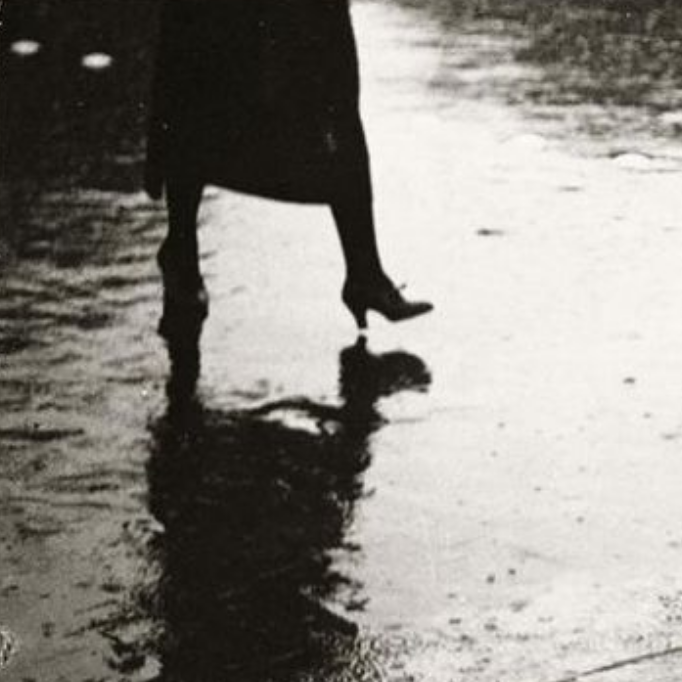 Image from Brassai (cropped), 1932.